It’s not something I ever thought I’d do…. I mean, a weight loss article? The thing is, people keep asking, and it just so happens that mountain biking is one of the best ways there is to lose a bit of weight. So, it’s time to put on my personal trainer hat – let’s have a chat about getting into mountain biking for weight loss purposes. We’ll have a wee look into the sports science to start with, and then at why mountain biking is so much better than just about any other type of exercise for weight loss. So, let’s start off simple: mountain biking is exactly the right sort of exercise when you’re concerned with weight loss. Firstly, it’s aerobic exercise (or cardiovascular-based exercise) rather than anaerobic exercise (short bursts of powerful repetitions such as free-weights, push-ups or shuttle runs). We store fat to provide energy for when we have none readily available in our system. This helps us carry on when we’ve exhausted our energy supplies from recently eaten food. Unfortunately, many people consume more energy than they need and so it gets stored for a later date in the form of body fat. When you’re inactive, this date never arrives and you so the excess fat is never burned up. Cue beer belly, love handles and all those other good things. Without activity, they’re never shifting. When it comes to getting rid of this excess body fat, we need to first use up calories that are readily available. For most people, this doesn’t take place until you get your heart rate up to a reasonably high level. The general consensus amongst the sports science community (although this is always debated) is that this takes place after around twenty minutes or so of moderate cardio. So, Why is Mountain Biking for Weight Loss So Effective? To start with, Mountain Biking is a sport which is really easy to do for over 20 minutes. You’ll struggle to find a trail that takes less. Second, it’s easily hard enough work to raise the heart rate to a good level. But, that’s not enough – that doesn’t separate us from the road bikers, the runners and the power walkers. Instead, let’s put forward a case for why mountain biking is particularly awesome at shifting that weight. The Key: Mountain Biking is Fun! Doing something that can be extremely repetitive, boring and also painful for long durations takes an extraordinary amount of willpower. Unfortunately, most cardiovascular exercise fits this description perfectly. Take a look at my endless quest to find ways of making the turbo trainer fun for example. Boredom is one of the biggest reasons why people struggle with exercise. That’s why the Sufferfest videos do so well, although you need a turbo trainer for that. The pain alone is not so bad when you are having fun, it’s easily ignored. But to stare at a blank wall in a gym while on a treadmill, experiencing this pain and listening to awful music; it’s more than most people can bare. Now think back to the times in your life when you’ve suddenly found yourself absolutely drenched in sweat, without even realizing it. Likely, you were doing something entertaining at the time. Be it a game of football with your friends, a game of volleyball on the beach or while taking a long walk to a new and interesting place in the hot sun. Doing something entertaining while working-out can make it seem that you’re not working out at all. Using a mountain bike for weight loss is ideal in this regard. It can be much more interesting than road biking, especially if you live in or near anywhere with some great scenery. Or, if you’re close to a decent forest trail, the variety is so much better. It can seem a lot more worthwhile slowly cycling up a steep incline when you have a beautiful natural vista waiting for you at the top. If you are traversing down a 30% gradient, on a slippery slope, it’s very difficult to be bored. Quite the opposite, your mind is working so hard that you never notice the effort you’re putting in. Keeping in the right gear, choosing the right body position, keep the wheels on-line, all keeps you more than occupied. Plus, if you are going off-the-beaten-track, there’s even plenty of route-selection to take into account. If you’re planning a long off-road journey with your mountain bike, then you’ll likely need to learn how to orientate your map, work out the grid/magnetic angle, check the contour lines, and take a bearing with a compass. You may also need to take into account other factors such as; appropriate clothing, water, shelter and food. So there’s plenty to think about if you are planning such a journey. While road biking is often just a case of blindly following a route which you know well, mountain biking is for the explorer at heart. The last big advantage of mountain biking is the sheer range of effort you’ll go through during your ride. During other forms of exercise it’s really easy to get complacent. You can be running along and settle into an easy pace, letting your heart rate tail off to the low 100s. It’s the same with road biking, it’s very easy to find yourself coasting. When using mountain biking for weight loss though, there’s no such thing as coasting. Off-road trails go up and down faster than a see-saw, and require you to change your effort on a minute by minute basis. You’ll be easy pedalling one minute, only to get out of the saddle and power up a 30 degree slope the next. This huge variety keeps your heart rate up, and makes sure you never get complacent. Variety keeps you and your heart on it’s toes, speeding up that weight loss no end. So, what more reason do you need? I hope this has inspired you to get out on the trails and start mountain biking for weight loss and exercise. Tell me what you think though – let me know if you think mountain biking is good for losing weight. Tell me your stories, I’d love to hear them! Mountain biking certainly helps, along with a sensible diet, in dropping off the pounds (stones). I decided on Jan 1st 2013 to do something about my weight, although I didn’t weigh myself until Jan 17th (no scales). At that point I weighed 18st 5.75lb, quite porky, I’m sure you’ll agree. At my last weigh in 3 days ago on the 21st December 2013, I weighed 14st 5.75lb – exactly 4 stone lost, and I feel great, even planning a trip to the Alps for the summer of 2014. Hopefully, by then, I’ll be down to 13st. 2016 and your article is spot on. I tried some stuff to try to get in better shape and pretty much failed cos I got bored. I’ve started gym 6 times and left within a month. I started running. I have a nice park close to my house so pretty much the perfect scenario. Failed again, after two months I quit, doing the same route day after day does not motivate you. Than i thought getting into MTB, best decision ever. Before it was like “Oh crap now I have to go to the gym” whether now I try to squeeze every free time I have and go into rides. I’ve made a lot of new friends, did some great trips together, rode some awesome trails and discovered new places and participated on XC race recently after just 6-7 months of MTBing. I so much wish I had discover this thing sooner. Good article! I love running in the woods but can’t anymore because of my back. I just took up mountain biking this spring to supplement (supplant?) hiking for enjoyment/exercise. I’m in decent shape now but still a bit over weight. I haven’t changed my diet much. I’ve been choosing to start with exercise first and then tune my eating (my wife and I have a history of doing unsustainable cleanses and other diets where we lose weight and then gain it back quickly, so I’m being careful with how I change my diet initially). So that history aside, I’m finding that after intense rides, I’m exhausted for a couple days and I feel like I’m not eating the right things. I know I’m getting enough fat, but not sure about carbs. I’m not looking to lose weight initially. I just want to find a healthy groove where I’m eating what I need to remain active and not unnecessarily stress my body because I’m not eating enough of something. I figure I’ll tweak it for weight loss once I get that part under control. Any pointers on what to eat to sustain actively mountain biking? If you think Mtn Biking is only cardio and not anaerobic, then you haven’t gone up a steep enough hill. 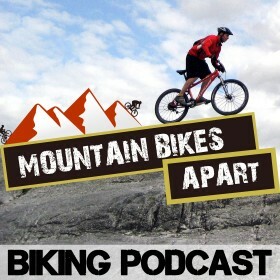 I agree 100%, more fun and interactive, higher brain activity, more prep and disipline to “survive” the unexpected, consantly changing tempo, constantly changing scenery, and i guess you forgot to mention that mtb has many turns! The only thing you didnt mention is which parts of the body lose weight. I’ve been cycling for almost 15 years now, never stepped foot in a gym, and only in the last two years started doing P90x once a week or two. Riding two or three days a week, 10 to 20 miles each, really keeps you skinny everywhere, except the places that cycling doesnt use. The main one is the belly. I have had small love handles my wntire life, and only since i started “cross training” have i seen them reduce. Heck, im so skinny the metal plate in my collarbone sticks and the doc said i need to eat something. But just a few inches lower and i am considered overweight. That being said, the article is spot on. I woukd just follow up with a note sugesting to cross train to work out those areas that cycling does not.